The biggest drawback to larger utilisation of renewable energy generation has always been their intermittency. The weather conditions that can be harnessed to generate electricity are, by their nature, transient, and unless energy can be stored and put onto distribution grids when generation is not possible, renewables will struggle to displace power stations that are available around the clock, day in and day out. The search for materials that can effectively store the large amounts of energy necessary and discharge it efficiently has become more intense in recent years. 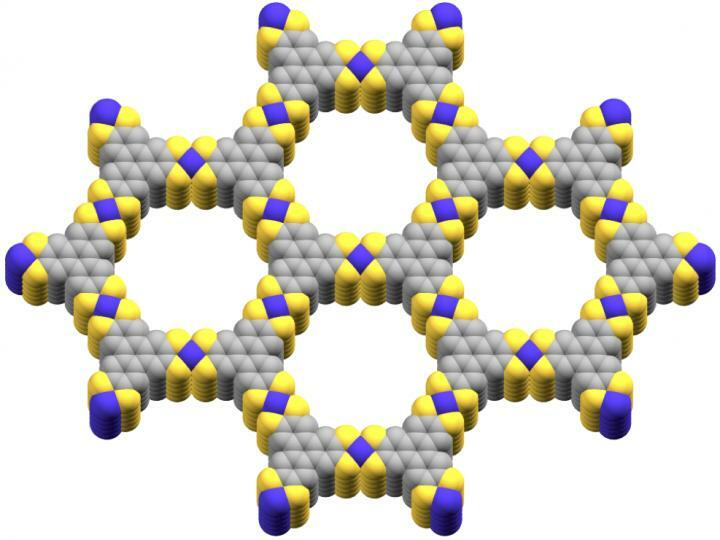 One promising candidate is the group of materials known as metal-organic frameworks (MOFs). These highly-porous materials have been used in many applications in recent years, from storing gases to catalysing reactions that convert carbon dioxide into fuels. The one barrier to their use in energy storage has been their inability to conduct electricity. The new discovery from chemists at the University of Southern California (USC) may change that. A group from the USC’s Dornsife College in Los Angeles has published a paper in the Journal of the American Chemical Society describing a MOF containing cobalt and sulphur that, they claim, conducts electricity both like a semiconductor and a metal, with the greatest conductivity occurring at very high and very low temperatures (the semiconducting properties are most pronounced at around 180K (-93°C). This band-like conduction behaviour has never before been observed in a MOF, they state. The compound has a two-dimensional structure somewhat similar to graphene. “The natural porosity of the metal-organic framework makes it ideal for reducing the mass of material, allowing for lighter, more compact devices,” commented team member Brent Melot. “Metallic conductivity in tandem with other catalytic properties would add to its potential for renewable energy production and storage” added assistant professor Smaranda Marinescu. Materials like MOF will give a real boost to production and use of non-conventional energy.